Last Saturday I had the immense pleasure of going to the Grandin market for the first time since the last weekend of October–and let me tell you, it was good to be back! After catching up with farmers and producers I hadn’t seen in months, I finally settled on buying a bunch of new herbs & vegetables to plant in the garden (lemon balm, sage, tons of basil, spaghetti squash, etc.) along with some lettuce and fresh sweet cherries. One of my favorite scores, though, was finding the chicken of the woods mushrooms again! Oh, how I’ve missed these strange, chickeny fungi. The last couple of times I had them I simply braised or seared them, but this time I decided to go out on a limb–a highly sacrilegious limb, or so it felt. You see, the mushrooms are always my most expensive purchase–$5 for about two servings (although I stretch it out)–and while that’s all relative, the thought of deep frying such expensive delicacies seemed wrong. A couple of weeks ago I spent the evening chatting with the man who holds the title of the largest morel found in Iowa. This guy hunts up morels so often that he deep fries them. 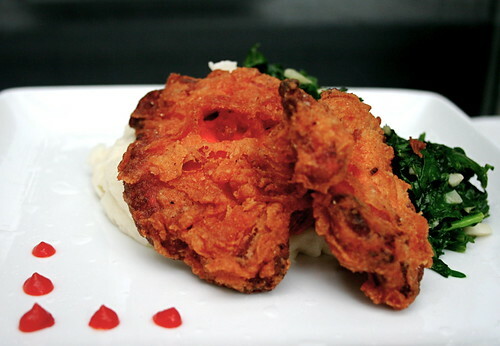 I gave him hell for that–I mean, why on earth would anyone deep fry a morel?! It’s just wrong! I’ve only had the chance to eat them twice in my life and this man deep fries them?? Well…I deep fried my chicken of the woods and holy mother of mary they were awesome. The batter was just like the fried chicken I grew up eating at church picnics (cheesy but true) and the mushroom still, I honestly swear, tastes like and has the texture of chicken. It’s uncanny. Sacrilegious or no, these fungi are wicked good. Thoroughly wash and clean the mushrooms and cut into desired size. Whisk together the egg replacer and the water in a bowl until foamy and thick. Add the siracha/hot sauce. In a pie pan or 8×8 baking dish, mix together the self-rising flour, salt, and pepper. Warm at least 3 inches of vegetable in a pot (I used my circa 1973 Fry Daddy) until a drop of water crackles and pops when flicked into the oil. Dredge the mushrooms in the egg replacer mixture and then in the flour, thoroughly coating each piece. Fry two or three mushroom pieces at a time, being sure not to crowd because that will lower the temperature of the oil. Once golden brown, place on paper towels to drain excess oil. There is NOTHING wrong about those mushrooms! I am so jealous of the plants you are able to grow! I have only had these mushrooms once but I remember them being so believable as chicken that I had to ask twice in the restaurant to make sure that they weren’t. So I totally believe that these taste like fried chicken! What a great idea. I still need to get my hands on these! I don’t think it’s bad to deep-fry them… you only live once, right? oh my goodness, this looks out of control! …you know, in a good way! I have never had those kind of mushrooms but I’ve always heard they are incredible. You prepared them so beautifully, the texture looks light and crisp and oh so delicious. YUMM! I applaud your creativity! I never had that kind of mushroom before, but have heard they are delicious (at $5 for 2 servings they better be!). I bet they were better than real fried chicken! Apparently these mushrooms grow over here. I’ve never seen them in a shop though. I need to go mushroom hunting this fall. Your recipe sounds awesome. This is so cool! I’ve never been lucky enough to find these mushrooms myself, but they sound so delicious and versatile… I hope I can get my hands on them some day! Wonder if I could do this with portobello mushrooms…. First of all southern fired chicken of the wood looks great and reading it made me crave for it. Sad thing is here we will have to wait till July for farmers market to start. i have totally gotta find those mushies, Jes. deep frying them sounds crazy & awesome! oooh, yay! i looooove that you’ve got sriracha in this as well. did you say you found sweet cherries? now i’ve gotta find cherries, too. i haven’t had fresh ones in forever…. man, i loooove them so much & could totally see making some into a pie with your gluten-free crust recipe. happyanddeliciousface! not too sure what’s going on this weekend here. i’ve got a 5K run on saturday, but i think with the long weekend ahead most richmonders will be headed down to the river for sunbathing on the rocks & swimming and such. w00t! Believe it or not, I’ve actually put aside my seething hatred of mushrooms and looked for these chickeny things based on your posts about them. I might actually be able to choke them down if they were deep fried – this looks and sounds delicious. I don’t know if I want to find them or not! I was just talking about these mushrooms with friends, Jes. Your recipe sounds perfect for them. Just made this recipe and served it with our favorite wing sauce. Outstanding! I love love chicken of the woods. And I’m glad I found this recipe after imagining pretty much the same dish! Finally found them this year after years of searching. Just a note to chicken of the woods newbies – 1 in 10 people is very allergic to them! as in, barfing all night long allergic. Tread with caution! Just tried them for the first time today. Mine were fresh and had a lemony chicken flavor and texture. Only ate about six french fry size pieces in case of an allergic reaction. It’s been 3 hours and none thank God. I love these things. I am looking forward to trying your recipe sounds scrumptious. I found mine it’s probably about three or four pounds. I found one hunting last year had to be four or five times larger than this one but I didn’t know it was safe to eat much less delicious. Thank You. This was INCREDIBLE!!! We came across some of these mushrooms last week at our local co-op and had to try them… We didn’t know how to best prepare them, so when I found your recipe, I knew it was our answer! Can’t believe how much this tasted like fried chicken – and it’s way better, in my opinion! Really want to get more of these!! Thanks for an awesome recipe! Super easy to find, grows almost everywhere. Found my first one this season, yesterday (though I still have some in my freezer from my 22lb find last fall). The one I just found is a different variety laetiporus cincinnatus and is white, not yellow. It was also found on a conifer. SOME people have gastrointestinal discomfort to ones grown of conifers, doesn’t make them poisonous, just depends if you are sensitive to it. We ate them in “chicken” alfredo last night with no adverse reactions to them. I’m planning on trying this recipe for lunch today, looks good! Thank you for posting this recipe. I just made it and it was incredible! Easy to make and very yummy. Five stars!